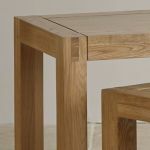 The Alto Natural Solid Oak Nest of Tables combines modern design with the time-honoured, quality feel of box finger joints; an attractive style of joint which dates back thousands of years. 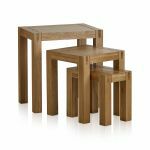 A nest of tables is an extremely handy piece of furniture that can be of use in any room of the house; allowing you to maximise on space by storing three tables in one. 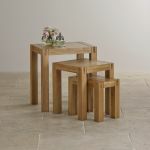 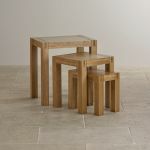 This nest of tables features 5cm thick solid oak legs and table-tops with attractive finger joints in every top corner. 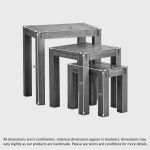 This gives the tables an unrivalled feel of quality and strength. The oak is finished with a durable wax to enhance the exquisite grain patterns of the wood.